Knowledge as a public good – honest! We had a discussion about the obvious: what do Brexit/Trump/dislike of facts and experts imply both for universities and for a scholarly press? David Runciman made the point that we academics see ourselves as producers of knowledge, a public good in a knowledge economy. The votes suggest half the public doesn’t agree, whether they are right or wrong. He also strongly criticised the ‘impact agenda’ which is now part of the Research Excellence Framework. I somewhat disagree with this, as it seems entirely healthy for academics to have to think about the outside world and how their work meshes with it. I do agree with David’s point that the way ‘impact’ is interpreted in practice favours the London universities, Oxford and Cambridge, as people are often expected to demonstrate their ‘impact’ through contacts with “elite networks of influence” (in his words). In the UK, they are massively London-centric. However, if so many citizens fail to see any positive spillovers from academic work – knowledge production – it’s all the more important to think about how to improve and demonstrate impact in ways that don’t centre on influencing Whitehall and Westminster. 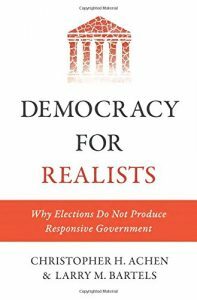 An eminent political scientist, David said the book he was turning to to understand political trends is Democracy for Realists. I must add it to the ‘to read’ pile. This entry was posted in Main Page and tagged political economy, publishing by Diane Coyle. Bookmark the permalink. Have you read Bryan Caplan’s “myth of the rational voter”? Curious about what you’d think of it. I haven’t – will look it up. Thank you. I spend lots of time on blogs, but prefer read … books. I do have friends with kindles, but I still don’t like them. Insofar as “knowledge production” so often produces useful idiot socialists, the public is more correct than academia. If the humanities are full of socialists who hide behind “good intentions” when the actual policies produce actual poverty, like in Cuba and Venezuela, it’s fair to say we need less of that junk knowledge. In the USA, there is secret, dishonest discrimination against Christians, pro-life, & Republicans in most Universities. It’s probably illegal, but too difficult to prove beyond a reasonable doubt. See Jonathan Haidt on it, I’d guess OxBridge is full of PC too.